In addition to being National Humor Month, National Pecan Month, and Stress Awareness Month, April has been designated as National Poetry Month. 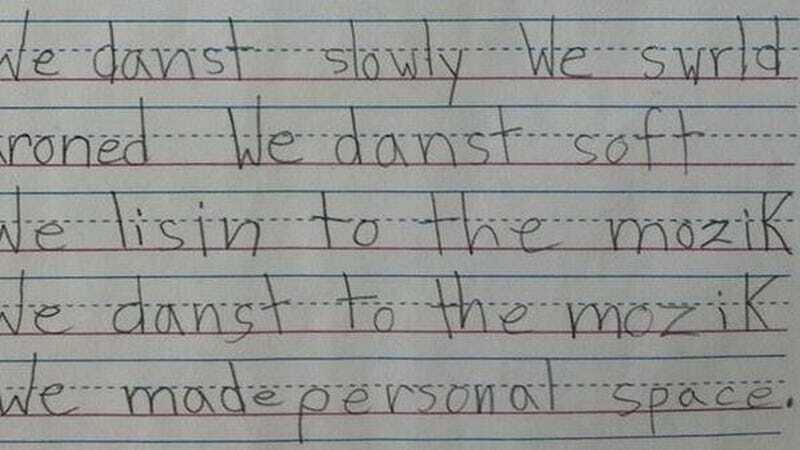 And now that the dust from all of the raging monthlong poem-battles has settled, it seems that Poetry has a new champion — a six-year-old from the Lower East Side of Manhattan. The poem and drawing were photographed by Jason Gardner, who noticed the poem hanging in an elementary school hallway. On its blog, WNYC show Studio 360 has deemed it their "favorite poem of National Poetry Month," and I'm inclined to agree. Not only because most poetry that was not written by Billy Collins is garbage, but because this kid really knows what's up when it comes to personal space.